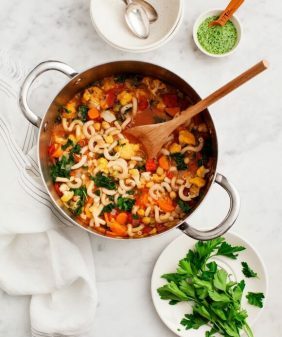 The perfect soup to welcome fall! This cozy, creamy corn chowder is thickened with split peas, which provide great plant-based protein. If I had to choose 2 favorite foods, they would be, without question, peaches and corn. 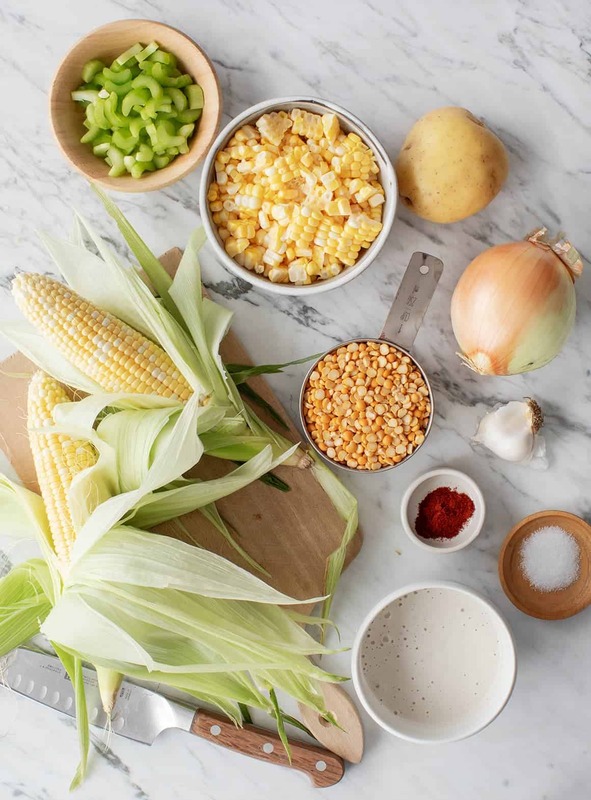 While we’ve made our peace with peaches for this season, there’s still some wonderful corn at our farmers markets, which inspired me to make this corn chowder! It’s such a wonderful recipe to transition from summer to fall. 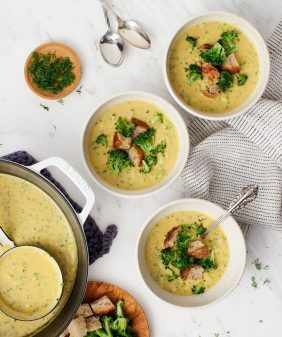 I’m a big fan of making healthy soups that are thick and creamy without using actual cream, like this creamy broccoli soup or this creamy tomato soup. 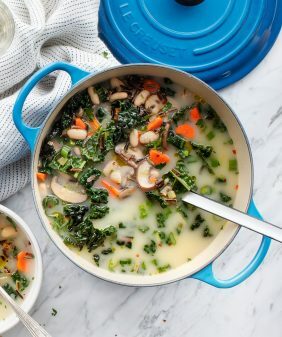 I love that this chowder uses yellow split peas – they thicken the soup nicely while adding some great plant-based protein. 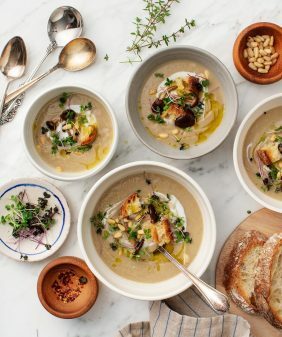 This chowder recipe comes from my friend Gena Hamshaw’s book Power Plates, which is full of 100 well-balanced vegan meals. You may know Gena from the book Vegan, which is another one of my favorite cookbooks. Power Plates is full of hearty salads, great grain bowls, soups, stews, and healthy pastas. It’s the perfect book to have as we head into the fall and winter because she has so many delicious, nourishing comfort food recipes. I have my eye on the Curried Tomato Stew with Chickpea Dumplings, and a beautiful recipe for Korean Tempeh Bowls with Broccoli and Brown Rice. But let’s get back to this chowder! I love how it’s thick and creamy but in a light, feel-good way. I crisped up some coconut bacon for my topping, then added some chives and fresh parsley. Serve your chowder in a big mug with some crusty bread and enjoy fall! 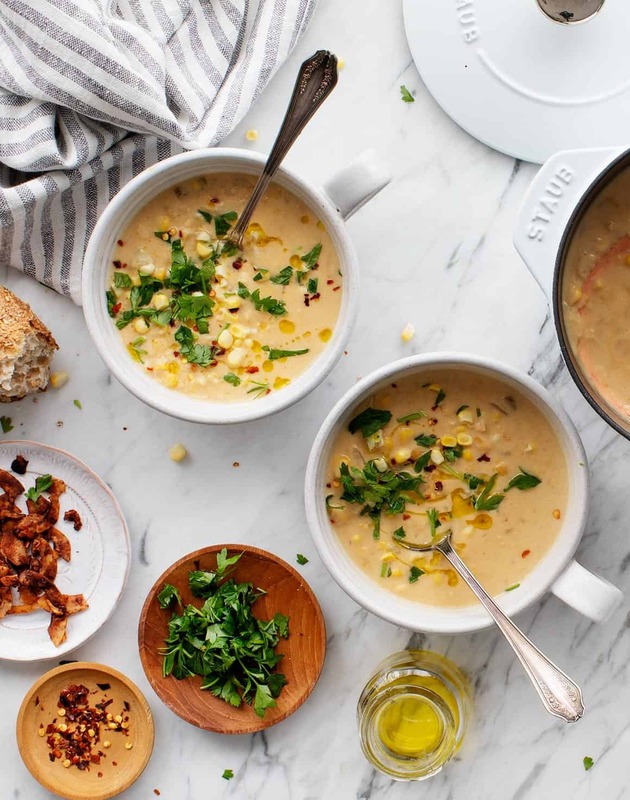 Delicious, cozy, corn chowder! Adapted from Power Plates by Gena Hamshaw. Make the cashew cream. Combine the cashews, water, and salt in a blender and process until very smooth. Set ¾ cup aside. Heat the oil in a large pot over medium heat. Add the onion and celery and cook, stirring occasionally, for 5 to 7 minutes, until the onion is tender and translucent. Add the garlic and cook, stirring constantly, for 1 minute. Stir in the broth, split peas, potato, corn, paprika, and salt and bring to a boil over high heat. Lower the heat, cover, and simmer, stirring occasionally, for about 45 minutes, until the split peas are completely tender. Use an immersion blender to partially puree the soup, or puree about half of it in a regular blender and return it to the pot. Stir in the Cashew Cream and apple cider vinegar. Taste and adjust the seasonings if desired. (I added up to 1 teaspoon more sea salt here). Serve piping hot, with any desired toppings. Preheat the oven to 350°F and line a baking sheet with parchment paper. Place the coconut flakes along with the tamari, maple syrup and smoked paprika on the pan and toss gently to coat. Spread in a thin layer on the pan and bake until dark golden brown and slightly crispy, about 10 minutes. I can’t wait to get back to my kitchen and try this out the soonest. I started a healthy lifestyle just last month and recipes like these are all I need to get started. Thank you! I hope you love it as much as we did! Hi, Can you use whole milk instead of cashew cream? or would heavy cream be better? Love all your soup recipes. I make your black bean chili once a month usually! Hi Adriana, I think either would be just fine – the cashew cream was about the consistency of a heavy cream, but the other elements (corn, split, peas, potato), all help thicken it as well. I’m glad you’re loving the black bean chili! This is a very intriguing recipe. I grew up on yellow split pea soup and didn’t care much for it, but I’m thinking that after 40-50 years without eating yellow split peas, I’m ready to try them again. Hi Susan, I hope you love it – the corn gives it a really interesting flavor and the split peas provide texture and protein, more than anything else. It’s delish! Fresh corn is not so easy to get where I am; how would canned corn change the recipe/cooking time? Hi Kate, I think frozen corn might be better than canned, if you can find that. I wouldn’t change anything about the cook time. Hope that helps! Would coconut cream be a good substitute for the cashew cream? I know the consistency would be right, but unsure of the flavor profiles. So good! Made this tonight with frozen corn. Added roasted green Chile’s and topped with tortilla chips. And we have enough for left overs tomorrow. I’ll try the coconut bacon. Thanks for the recipe! 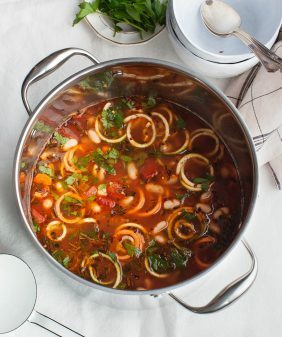 As soon as I saw your post I immediately thought of Gena’s recipe from Power Plates, I have the book and every recipe I’ve tried so far is a winner, including this fantastic soup! Whenever I make a batch…I think I’ve made this three times so far, it is enjoyed to the last drop! Nice job on finding this great recipe and posting it! I’ve never tried the topping of coconut bacon, but always add the chard, which makes it even healthier! it’s so good! We really enjoyed it! I forgot to add, I have not tried it with the cashew crema either, and your recipe does not call for chard but I add a whole bunch stemmed and chopped after blending half of the soup and let it simmer for another 10 minutes. I also like the soup completely un blended as well. YUM! 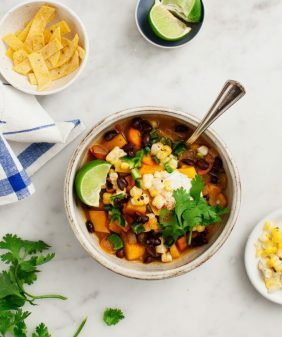 I can literally taste fall while reading this cozy recipe! Thanks for sharing such a unique and healthy corn recipe…..
keep sharing such a new and interesting recipes. Just made it and it is perfect, right down to the coconut bacon. Great recipe! I ended up simmering the cashews (instead of soaking) through the chopping of the veg right up to just before the cream would be added to the soup, and then pureed in the cashew water. Came out so so velvety smooth. This is definitely a new favourite. Thanks! Hi Alissa, oh I’m so happy to hear that you’ve been following for so long! Ha, I’m glad he loves the soup! My sons and daughter really love your recipes. Thank you for providing a good recipes for me to cook for my children. Really appreciate of what you have done. All my children will request me corn chowder each and every weekend. They really love it. Keep up the good work Jeanine! Love your work! I had a day off work today and made the corn chowder soup with yellow split peas. It was delicious and definitely a recipe for life! Thank you. Hi Puneeta, I’m so glad you enjoyed it! This was really delicious! It was a big hit with my family. The only issue I had was my split peas we’re still a little crunchy after simmering for an hour and a half… At which point I gave up and finished the soup because we needed to eat and I didn’t want the other veggies to turn to mush. Maybe I should’ve soaked them first? Hmm, wow, that’s a long time… I’ve only heard of that sort of thing happening at high altitude(? ), otherwise it might be an issue with the freshness of the split peas? Either way, I definitely think soaking would help (and it can’t hurt).